Let the good times roll! From high fashion to high speeds, McDonald’s Happy Meals. 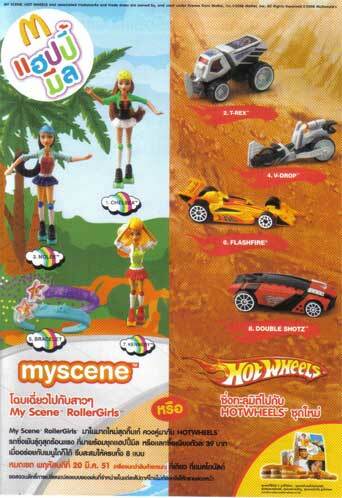 My Scene is a line of fashion dolls introduced by Mattel in 2002. Produced to rival MGA’s BRATZ and maybe to replace the Teen Skipper Line or the Generation girl Line, the series has branched out into a popular ten-doll collection that is still in production today. Kennedy, Chelsea and Nolee sporting roller disco gear complete with fashionable roller skates with rolling wheels. Rounding out this trendy collection are friendship bracelet to wear and share with friends. Kennedy – Featuring bright red skates that roll and a matching skirt, Kennedy is ready to go! For added fun, remove Kennedy’s helmet to style her long, blonde hair. Chelsea Chelsea sports a cropped green jacket, a star-studded helmet and skates that roll.Change her pose and style her hair for a fun new look. adorned with stars and connects together to form one high-style bracelet. Nolee Nolee looks sporty, yet glamorous, in her retro purple skirt, blue jacket and skates that roll. Her long black hair looks great beneath her bright blue helmet. 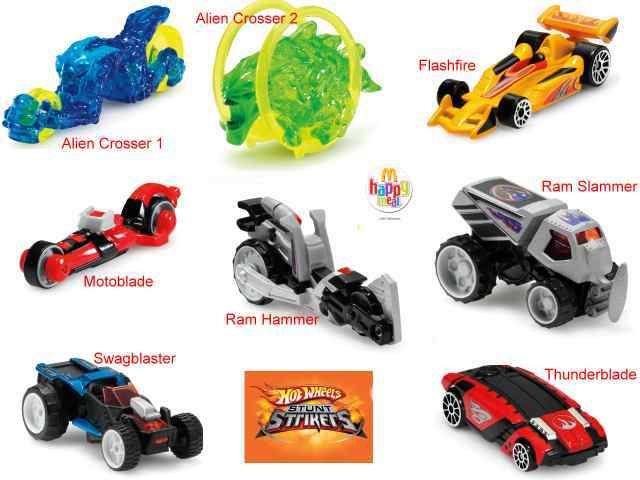 revved-up roadsters available exclusively in McDonald’s Happy Meals. features oversized wheels and translucent red windows. featuring blue and red flames lets young guests add their own finishing touches. A fixture on the racetrack, this yellow die-cast racecar is built for speed. Custom stickers add fun and flare to this high-octane racer. This low-riding car features a cool translucent black canopy and hot stamped wheels. 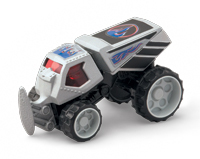 For added playtime fun, gray flame stickers are included to customize the black and red die-cast car. This Happymeal toy set has came to Mcdonalds America on September28 – October 25 2007 . But they gave out more toys and the names are different.T-rex ,Vdrop and Double Shotz are called Ram Slammer,Ram Hammer and Thunder Blade. 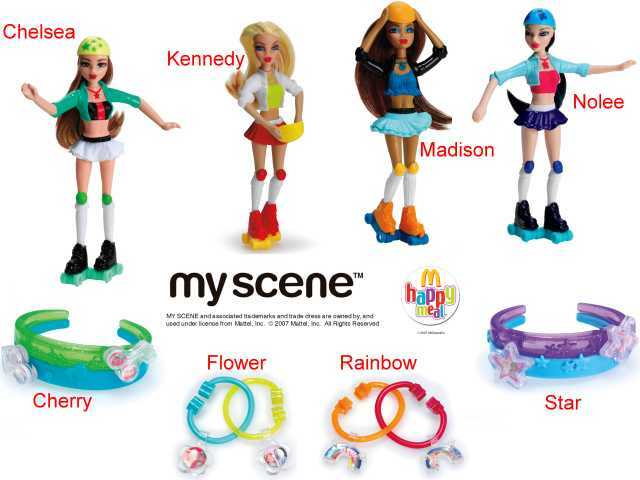 My scene had Madison and more Bracelets style. My mom makes such pretty doll dresses for myscene dolls. I wish I was 12 again! Then again I could collect dolls…. draining some of the water in your tub to get it underneath the filter.